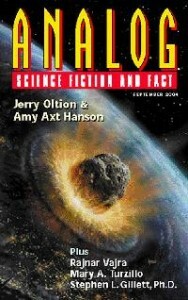 Jerry Oltion and Amy Axt Hanson. Trophies and Treasures. On a race over Mars’ dusty plains in which Winthrop Magnus Wellington III, known to his friends as ‘Welly’, and his manservant, Bentley, a top notch cove, try to keep the family fortunes and the honour of the family name against the underhand tactics of their opponents. If you like the humour of F. Gwynplaine MacIntyre, who features regularly in Analog, you are bound to love this. If said humour makes you cringe, then you probably won’t be over-impressed with this story. Joe Schembrie. The First Martian. More of an ‘Probability Zero’ piece – ie a short short with a simple conceit : the person chosen to be the first to Mars is chosen on account of his accident-proneness. Why? It makes better television. A teacher is working with remote teenagers – doubly remote, for they are (for a variety of reasons) not the most academic children, and they are also physically distant, and their lessons are two-way telecasts. Teacher has some success with the reluctant students, but the story moves from a fairly heavygoing amount of detail on the lessons as the students progress, to a somewhat contrived ending in which one student who has OD’d has to be rescued from a particularly unpleasant group of street teenagers. The street-jive talk of the young ‘kids’ feels very much like someone slightly older and from a different background trying to be ‘hip’. A military misdemeanour threatens the love between two soldiers (one of each gender). Their choice : court-martial or manipulation of their brains which will result in their being unaware of the love that they have for each other. They are faced with this stark dilemma, but in a couple of paras it is resolved, and they return to base as colleagues, not lovers. Apart from the serial installment, the Vajra story is the only substantial offering, and that is fairly heavy going. But the rest is fairly lightweight, so that makes it a fairly balanced issue!